← Some days, you *just* need to eat everything in sight. Since I had this surplus of sour cream on hand – and I needed to use it up ASAP – I, well, I decided to tackle the Mushroom Stroganoff. I found a recipe that was adapted from the Moosewood Cookbook, which is/was a TOTAL blast from my past – I feel like my mom made, like, a gazillion recipes from that cookbook as I was growing up. So I got all excited and gathered the ingredients together…and then my substitutions started. Instead of Dill I used Fennel Fronds. Instead of using another container of mushrooms, I reconstituted shiitakes and chopped them up and threw them in. It was terrible. Seriously terrible. And yes, thank you very much, I do indeed know it was all my fault. Won’t dignify this with a recipe. Won’t bother you with that recipe. Next time I’m back home at my parent’s place, perhaps I’ll ‘borrow’ mom’s copy of the cookbook. Perhaps I’ll use EXACTLY the ingredients the recipe calls for. Perhaps I’ll follow each and every step PRECISELY. Perhaps. There’s always hope. Why am I the only person on the planet that when they have extra sour cream they don’t think BAKED GOODS? No. I thought DINNER. Anyway, we had a lovely salad. One of my favorites. I can’t remember where I first had this dish, but I love making it every time Fennel becomes affordable once again. It was on sale this week – so HUZZAH! You take a bulb of fennel and shave it very thinly – either by hand or with a mandolin. You clean a thing/container/box of mushrooms – they’re what, 10 oz? 8 oz? Doesn’t really matter. It will be enough, whatever size you have. You slice those mushrooms up thinly as well. Ya know, I can never quite get them thin enough using the mandolin…I don’t think mine is sharp enough. How do you sharpen one of those things? 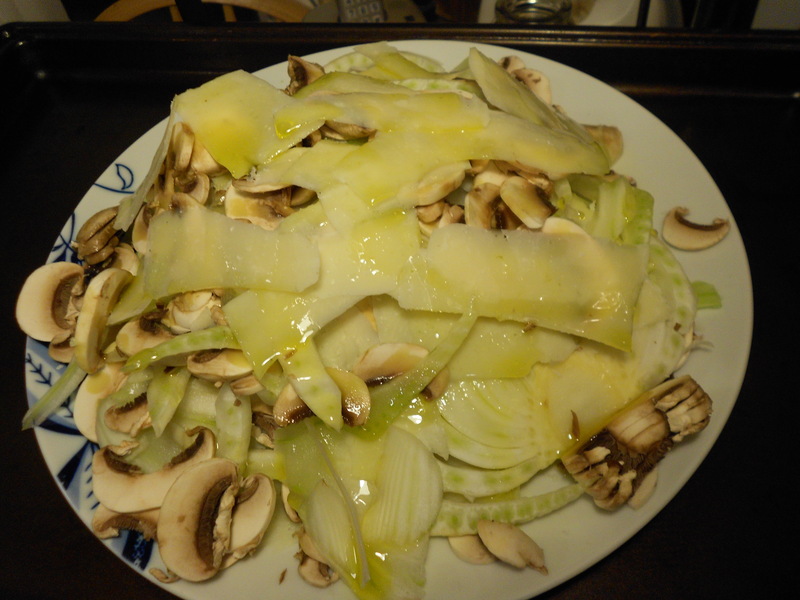 So you have a pile of shave fennel, and another one of mushrooms. Now – the Parmesan. Grab your handy-dandy vegetable peeler and shave off strips of of Parm. Now – the assembly starts! 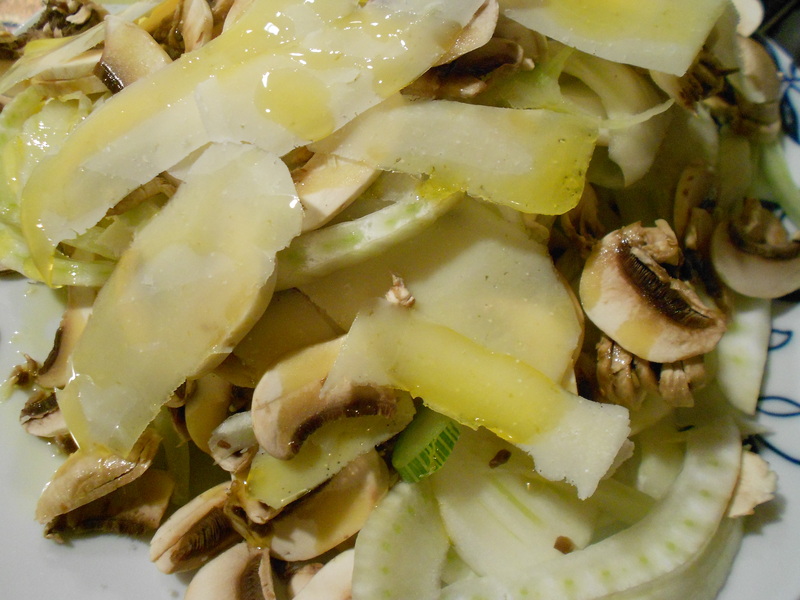 Grab your pretty plate and layer on the fennel, then the mushrooms, then some parmesan. Drizzle with a little of your very best olive oil and a teensy little crack of fresh pepper. Repeat until all your veg is gone. Now – step back and admire your layered crunchy salad. Use good olive oil here. It needs to stand out. 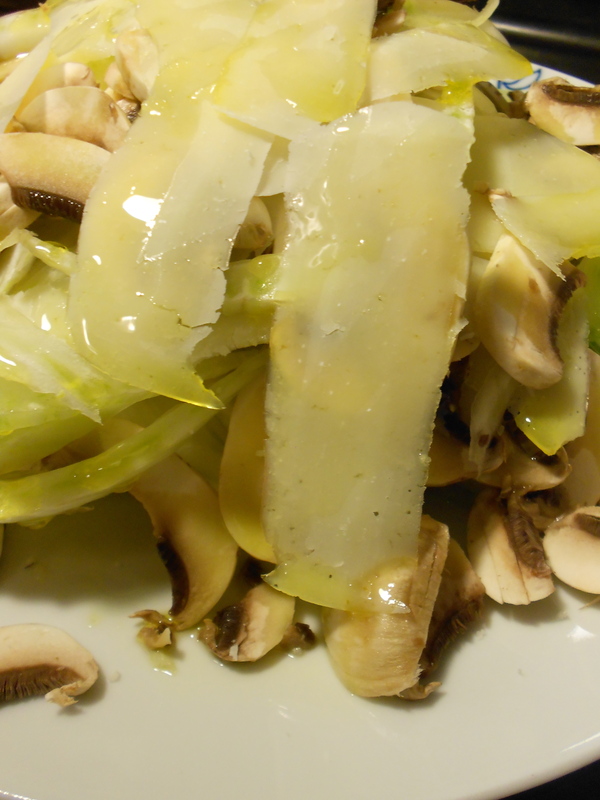 Shaved Fennel and Mushroom Salad by Me…since I don’t remember where I had it first so many years ago…. Olive Oil – the really good stuff. Use a veggie peeler to get these thin strips of Parmesan. 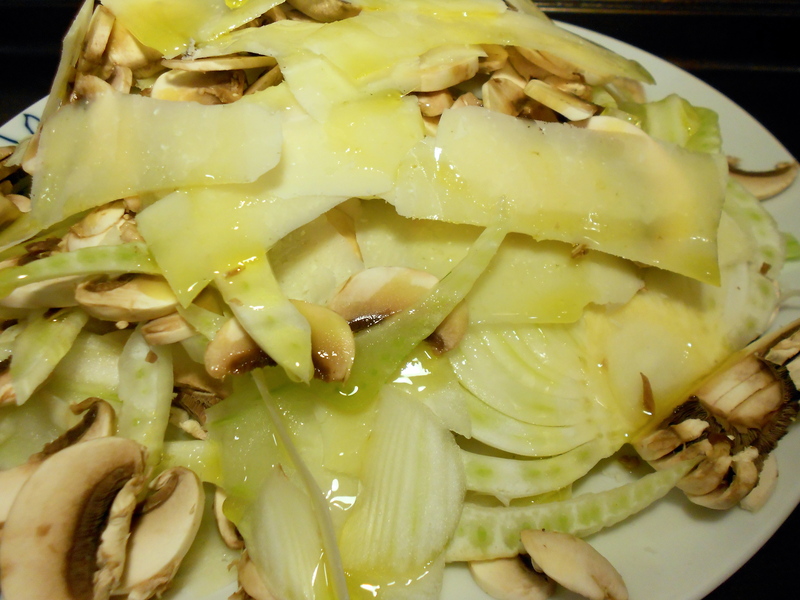 1- Using either a really sharp knife or a mandolin that’s sharper than mine, slice your fennel bulb in paper thin slices. Set aside. 2- Do the same with your mushrooms. Set aside. 3- Make a mound of Parmesan strips using your veggie peeler (use it like you’d peel a carrot). 4- ASSEMBLE! 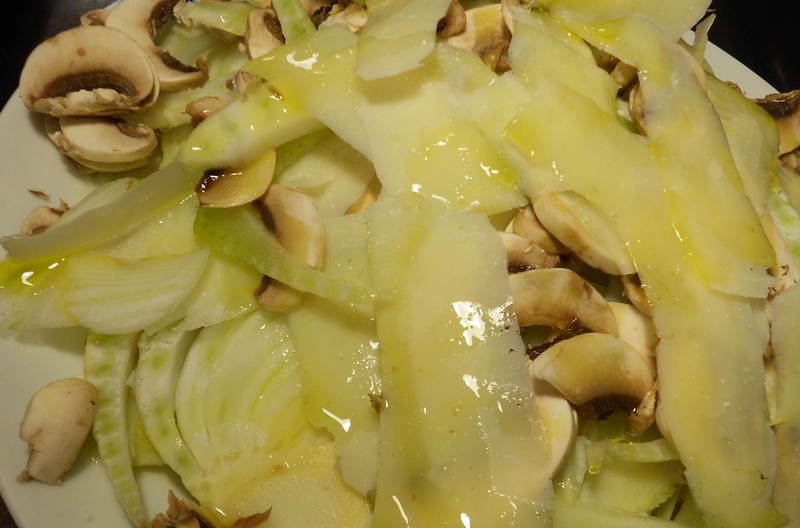 Layer the ingredients thusly: fennel – mushrooms – a few parmesan strips – drizzle LIGHTLY with your good olive oil (maybe 1 teaspoon of drizzle. Probably 1/2 a teaspoon – you’ll keep layering, so it’ll add up). Throw on a teeny pinch of salt and a crack or two of fresh pepper. Repeat this until all your supplies have run out. Drizzle one last little bit of olive oil on top, and one last pinch of salt and pepper. This is a big salad – it’s best to share. But only if you really love your dinner companion. Luckily, I do. I am terrible at substituting things too. Usually it works out fine, but sometimes its a total fail. Your salad looks great though! Shaved Parmesan is so simple – and makes everything just feel so elegant!